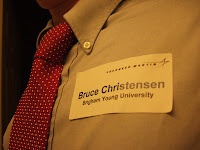 I flew to Colorado Springs last Thursday to interview for an internship at Lockheed Martin, the world's largest defense contractor. I left on Thursday night and came back Saturday night. My flight to Colorado was kind of fun. I took my GPS on the plane, and it was cool to watch our speed, altitude, and location change. I had chosen to sit in an exit row seat so that I would have more legroom, but I accidentally sat one row back. I'm glad I did, though, because I got to talk to a cool guy from Colorado Springs. I had a window seat, but it didn't do me much good for most of the flight because it was dark and cloudy. However, as we descended below the clouds as we approached Colorado Springs, and I could see the city. It really felt like the holidays when I looked out the window and saw neighborhoods full of houses decked in Christmas lights. I felt a little like Santa flying in on his sleigh. I arrived pretty late, so I just picked up my car (which turned out to be a minivan), drove to my hotel, and went to bed. I slept better that night than I had in a long time. I woke up the next morning to a cold, foggy day. Colorado Springs supposedly has 300 day of sun a year, but last Friday was certainly not one of them. I arrived at Lockheed right at 11:30, and when I got out of the car, I felt a strange sensation: freezing fog. Freezing fog is supercooled water vapor, which means that it's actually colder than the freezing point, but it hasn't actually frozen. To turn into ice, water needs a starting point--something solid that an ice crystal can grow on. Freezing fog just hangs around as water vapor in the air until it touches something like your car, a dust particle, or your skin, and then it freezes almost instantly. It was a strange feeling to walk through it. The group that I interviewed with is called Information Systems & Global Solutions. They're Lockheed Martin's largest division, and they do a wide variety of things. It seems like the group in Colorado Springs focuses on satellites, missiles, and command and control systems. They build and operate things like nuclear missiles, space junk tracking systems, satellite and space communications, and battlefield command and control information systems. After a boxed lunch, a quick tour of a secret-level conference room (make sure you leave your cell phone at the door! ), and a short presentation about Lockheed, I had interviews with four managers. Interestingly, they didn't ask me a single technical question; instead, they were all behavioral interviews. They asked typical questions about things like how I work in teams, how I communicate, and how I manage my time. I think that the people I talked to liked me, and I liked everyone that I met there. They seemed like genuinely good people who would be good coworkers. However, through the presentation and my interviews, it became clear that the division of Lockheed that I was interviewing with didn't have a lot of opportunities for me to do the kind of work that I want to do next summer. I want to work on embedded systems or digital logic design, designing hardware for things like cell phones, robots, or airplanes. Lockheed IS&GS does mostly systems integration, gluing preexisting systems together, rather than developing new hardware systems. Other parts of Lockheed Martin, like their Space Systems division, do have lots of opportunities in hardware development, and the people I talked to said that they would pass my information along. The prospect of working for a defense contractor raises some interesting questions. After all, they make stuff that kills lots of people, and they receive a huge portion of our taxes. I haven't totally decided how I feel about working for an organization like that. On the one hand, they develop some really cool technology that would be fun to work on. They make the F-16 fighter jet, lots of parts of the Space Shuttle, and intercontinental ballistic missiles--all things that I thought were really cool as a kid (and still do). However, there are lingering ethical considerations about working on military systems that I haven't quite worked through yet. It would certainly be a lot simpler to just work on space systems, where I could still do cool stuff without having to worry about the ethics of killing people. It was snowing a little bit when I left my interview around 5 p.m., and the snow picked up through the night. I grabbed dinner (and Cold Stone for dessert, since Lockheed was paying) and then went back to my hotel room to plan my hike for the next day. There were no flights available out of Colorado Springs late enough on Friday night, so instead of flying back Saturday morning, I had decided to stay the day and go hiking. After checking conditions and routes, I decided to take the Crags Campground route up Pikes Peak. 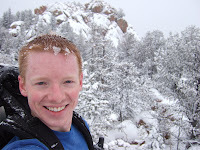 It would be a solo hike in the snow, with more falling through the day, but it was a safe route, and I felt prepared with warm clothes, good boots, a map, and my GPS. I packed my gear, set my alarm for 5 a.m., and went to bed. Although I set my alarm, there was one little problem: it turns out that I didn't actually turn it on. I woke up around 9:30 a.m. the next morning to a beautiful snowy day. The good news is that I got to eat a yummy hotel breakfast; the bad news is that I woke up too late to hike Pikes Peak. I did a little research and chose to hike up Raspberry Mountain, a smaller peak south of Pikes. I wrote up a trip report and took some pictures. 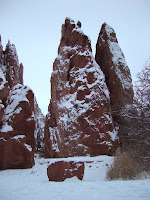 I made good time on the way back, so on my way to the airport I stopped by Garden of the Gods, a park full of nifty sandstone formations. It looked like it would be a fun place to hike and climb. I had just a little while there, so I didn't get to see a lot of it. However, I got out and hiked around for a few minutes, and during that time I saw a herd of female deer and then a lone buck a few minutes later. I also saw a rabbit and some birds. I took some pictures. My flight back was delayed because of weather, but it was pretty uneventful. I sat next to a guy who was in Colorado Springs at a wrestling camp. He's apparently a good wrestler (three spots away from being in the Olympics), but he sure wasn't a very enthusiastic talker, so I just read for most of the flight. I'm glad I went to Colorado this weekend. Interview trips are a little lonely, but it's fun to see what a company and a place are like.